Update: sadly Ric is no longer able to be with us for the Festival. Continuing our series of posts introducing the many speakers who will be giving talks during the LGBT History Festival at M Shed next February. Ric Brady of Pagelight Productions will be presenting “A Very Victorian Scandal” as part of the National History Day on Saturday, February 20th. Pagelight Productions, headed by Stephen Hornby and Ric Brady, is an independent production company based in Manchester. For the 2015 National Festival of LGBT History they staged a dramatic production commissioned by the Festival. 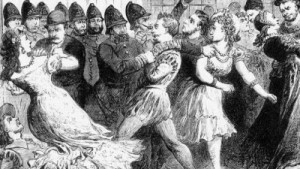 “A Very Victorian Scandal” is set in 1880 and is the story of the largest every police raid on an LGBT venue in UK history and had been largely forgotten. In Bristol this year Ric Brady will be presenting some exclusive film of the performance. He will also set out the vision for future dramatisations of the previously unknown LGBT history, the partnerships between creatives and academics and the call for submission for 2017.